The Montreal Expos’ 1976 season was a soap opera. Clubhouse dissension, along with the second-worst record in franchise history (55-107), made for a long, frustrating year, so it only seemed appropriate that fans had to “tune in tomorrow” to find out if Tim Foli became the first Expo to ever hit for the cycle (spoiler alert: He did).1 His cycle was a natural one — he hit a single, double, triple, and home run in that order in a 12-6 Expos victory over the Cubs. As if that wasn’t enough to make the game unusual, the umpires accused both clubs of pulling off stunts when the skies threatened to bring the game to an early end. The Expos had a reasonable 3-5 record when they faced the Cubs in the second of a three-game series. Steve Rogers had gone 8⅓ innings on April 19 in a 4-3 Montreal win over Chicago’s Bill Bonham. After an off-day on April 20, Geoff Zahn of the Cubs took the mound against old pro Woodie Fryman. Zahn was the author of his own misfortune in the first inning. 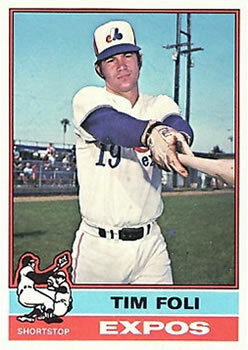 He walked the first two Expos hitters, Pepe Mangual and Nate Colbert. A groundball fielder’s choice by Mike Jorgensen forced Colbert at second but allowed Mangual to reach third. Zahn then muffed a comebacker to the mound by right fielder Gary Carter, which scored Mangual to give the Expos a 1-0 lead. The Cubs took a short-lived 2-1 lead in the bottom of the first when Jose Cardenal homered with leadoff hitter Rick Monday, who had singled, on base. The Expos rallied in the top of the second. Barry Foote led off with a single and reached third on Foli’s first hit of the game, a line-drive single to left. Pete Mackanin got the Expos’ third consecutive single, which drove in Foote and sent Foli to second. Fryman moved the runners up with a sacrifice bunt. Both Foli and Mackanin scored on a single by Mangual. The Expos led 4-2 and were on their way to a rout. Foli got his double in the third. With one out and new Cubs pitcher Tom Dettore on the mound, Larry Parrish singled to left and moved to third on a double by Foote. Foli’s two-bagger drove home Parrish and Foote, giving the Expos a 6-2 lead. The clubs traded solo shots in the fourth, with Mike Jorgensen going yard for Montreal and Cubs catcher Steve Swisher responding in the bottom of the inning. Then came the fun-filled fifth. Wrigley Field didn’t have lights back in 1976, so games in those days could still be called because of darkness. This particular game had already started 15 minutes late because of the weather, and had endured rain delays of 30, 31, 20, and 27 minutes. When the rain began falling in the top of the fifth, the Expos wanted to get through the inning quickly so the game would be official. The last thing the Expos needed was baserunners. Leadoff hitter Foote followed the script by grounding out to first. Foli was up next and swung at the first pitch from new Cubs pitcher Paul Reuschel, even though it was in another area code. He swung again and hit a screamer down the left-field line. He started running, touching first, then, second, then third — the triple was in the books — but kept on running and was an easy out at the plate. Mackanin was the next batter. When he let the first two pitches go by, players in the Expos’ dugout started jumping and screaming to get his attention and remind him that speed was of the essence. He swung at the next pitch and smacked it to right-center for another triple. Unlike Foli, Mackanin held up at third. Fryman was the next batter and he hit a single to drive Mackanin home. But instead of holding up at first, Fryman tried to stretch the hit into a double. Now, Fryman was 36 years old at the time and could never be confused with Lou Brock or Maury Wills — he was out by 10 feet, ending the inning. Umpiring crew chief Billy Williams was not happy with the Expos’ actions, and told the two managers between innings to stop the shenanigans. The Cubs, for their part, wanted to pour molasses on the proceedings to prevent the game from becoming official. Leadoff hitter Rick Monday kept stepping out of the batter’s box to clean his spikes, and when they weren’t clean enough, he walked over to the on-deck circle to go over them with a towel. These delaying tactics didn’t work and the game continued after the Cubs went down in order. In the top of the sixth, Reuschel stymied the Expos’ plans for a quick inning by letting them score at will. Mangual led the inning off with a single. New center fielder Jerry White homered. (In the bottom of the fifth, Mangual had replaced Colbert in left and White took Colbert’s spot in the lineup.) Jorgensen and Carter both walked, and Jorgensen scored on a single by third baseman Larry Parrish. The score now was 11-3. Don Carrithers replaced Fryman in the bottom of the sixth, and came through the inning unscathed. The umpiring crew suspended the game at that point not because of the weather, but because of darkness, which meant that the game had to resume the next day. The hot-tempered Foli went ballistic, charging at Williams and arguing that the game should be called on account of rain. That would have meant the game was official and didn’t need to continue the next day. To his credit, Foli was more concerned about the win than the personal milestone of hitting for the cycle. Before play resumed the next day, Foli brought the lineup card out for Expos manager Karl Kuehl so he could apologize for his behavior the previous day. When the action started again in the seventh, Buddy Schultz was on the hill for the Cubs, while Carrithers was still in there for Montreal. In the bottom of the inning, the Cubs made a minor dent in the Expos’ lead when Monday drove home shortstop Dave Rosello to make the score 11-4. Foli got that run back with his history-making home run in the top of the eighth. The Cubs scored too little too late in the bottom of the ninth. Third baseman Bill Madlock drove home two runs to end the scoring. The Cubs got some revenge and ended a five-game losing streak at the same time when they beat Montreal 5-4 in the regularly scheduled game. Foli’s cycle was one of the few bright spots in an otherwise forgettable year for Montreal. Kuehl was fired on September 3 after compiling a 43-85 record. Expos management eventually got tired of Foli’s tantrums and traded him to the San Francisco Giants on April 27, 1977, in an even-up deal for shortstop Chris Speier, who, ironically, became the second Expo to hit for the cycle. Webster, Gary. When in Doubt, Fire the Skipper: Midseason Managerial Changes in Major League Baseball (Jefferson, North Carolina: McFarland & Company, 2014). 1 The team had its worst record ever in 1969, the franchise’s first season, when it went 52-110. 2 “Cubs’ stall tactics backfire,” Daily Herald, Arlington Heights, Illinois, April 22, 1976. 3 Ian MacDonald, “Umps holler foul at delay tactics,” Montreal Gazette, April 22, 1976. 5 Ian MacDonald, “Top Expo Foli lets a hot bat do the talking,” Montreal Gazette, May 4, 1976.